Barcode label creator software used for automated data collection, which will help you to improve warehouse positions and enhance customer satisfaction. Using barcode maker tool you can easily create label in different formats like Tag, Sticker, Coupons and Rolls etc to fulfill all warehouse labeling needs. Using Barcode labels you can easily verify and view entire warehouse\manufacturing details at single time either at single place. Barcodes creator utility support 2D and Linear font symbologies and provides advanced barcode designing view for making stylish labels. If you want to speed-up, your business rather than wasting time in managing data entry process manually download and install the application available on website. 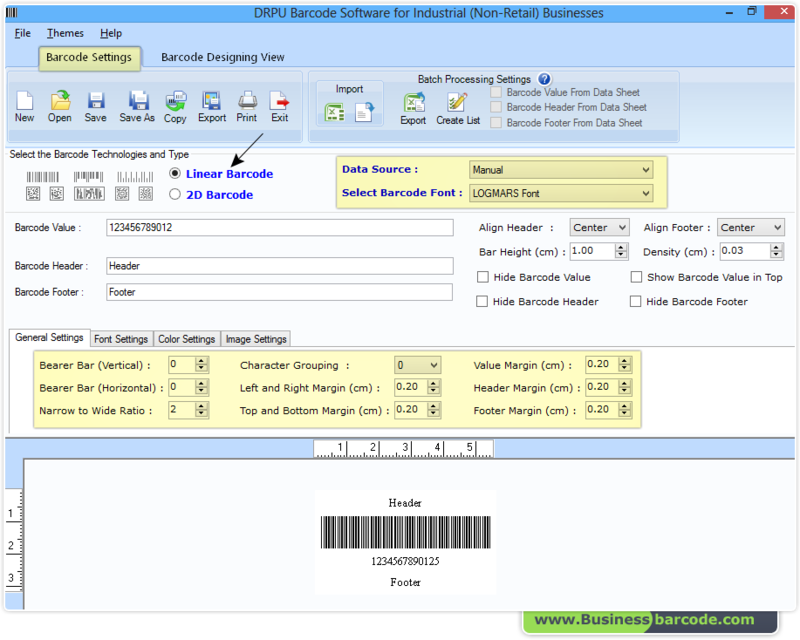 Select Barcode type (linear or 2D font) to design industrial barcode with general settings option. Support manufacturing industry barcode font symbologies including 2D (Aztec, QR Code, Maxi Code) and Linear (Full ASCII, UCC/EAN-128) etc. Software generates multiple barcode lists using Sequential Series, Constant Value Series and Random Series options.